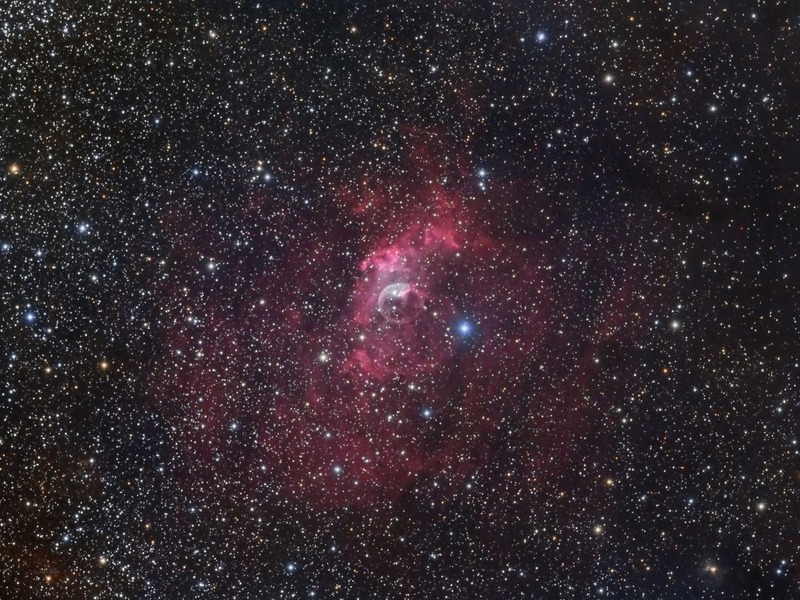 NGC 7635, the Bubble nebula, is an emission nebula in the constellation Cassiopeia. The Bubble nebula is set in a nebulous gas and dust cloud which provides a smooth backdrop for the sharply defined Bubble. The Bubble gets it shape from a massive Wolf-Rayet star named SAO 20575. A Wolf-Rayet star is a very large, hot, and young star that is rapidly shedding outer layers. These stars are larger than 20 solar masses and their temperatures range from 20,000K to over 50,000K. Wolf-Rayet stars eject large amounts of their mass and during this process the expelled layers take various shapes varying from circular to oval. This star is emitting a large amount of ultraviolet radiation travelling at 4 million miles per hour which shapes the ejected gas from the inside while the surrounding exterior gas cloud restricts the expansion giving a sharply defined edge which forms a bubble. SAO 20575 is the brighter star inside of the bubble to the upper left of center. SAO 20575 is 44 times larger than the sun and is a magnitude 8.71 star. It is moving away from the area and this is why it is not in the center of the bubble. The top picture was captured with a 1000mm FL telescope and shows the Bubble nebula and the surrounding gas cloud. This image was taken from my house in a Bortle 6 zone.